Reading the description, God Eater reminded me of Black Bullet, what with the Gastrea and weapons which were the only ones capable of killing them and what have you. Then I started watching it, and as much as I kept thinking about Black Bullet, I started thinking about Attack on Titan a little before it hit me that it reminded me more of Final Fantasy VII. Here's why: the main character's hair is similar to that of Cloud Strife's; main character is the silent type like Cloud; main character wields a Buster Sword like Cloud; the God Eater's logo (the army's logo) reminds me of the wolf brooch that Cloud wears; and the city seems to be set out like Midgar. What's more, Fenrir is the name of Cloud's bike which, in God Eater, is the name of humankind's last fortress of defence. Convinced? Okay enough about that. Time to tell you what this anime's all about. 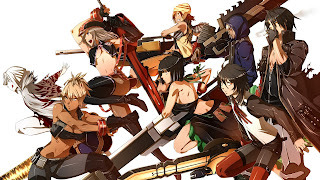 God Eater revolves around Lenka Utsugi and his determination to defeat the Aragami, mysterious creatures that suddenly appeared and are devouring everything in sight. His determination sees him turn to Fenrir, the defence fortress I mentioned earlier. There he obtains a bracelet permanently bound to him and has Aragami cells infused with his human cells, and he becomes a God Eater. This again kind of reminds me of FFVII since those who become SOLDIER are infused with Mako so they become stronger than normal humans; but whilst Cloud didn't actually make SOLDIER, he is infused with Mako. Anyway Lenka is referred to as a New-Type due to his weapon which is able to transform from a sword to a gun and vice versa which also includes a modification mechanism, and we learn that he's not the only New-Type God Eater. Story wise, God Eater seems to be going at a steady pace with each episode focusing on a specific character and how they contribute to both the story and Lenka's journey to become stronger and more able to defeat the Aragami. The battles in God Eater kind of remind me of Black Bullet, but more Monster Hunter when the supreme Unit 1 appear, and after dealing with the Aragami the "boss" Vajra shows up for example. These also seem to be where all the action is, and are a way for the story to develop. For example, we learn of why those who wield God Arcs are called God Eaters in episode 3. It's a good way of giving the story the boost it needs whilst it's going at its steady pace, not that the pacing is an issue as the story itself is quite interesting. Overall, God Eater seems to be inspired by many things, mainly the ones I've mentioned (include Tekken since the female character Sakuya reminds me of Anna with her hairstyle, and Fullmetal Alchemist because of the weapon mechanic who reminds me of Winry). The animation is great, giving an "anime meets video games" kind of feel to it which is a nice touch considering the battles are RPG-like. The characters all seem to be relaxed, each with a hint of personality different to one another, making the anime feel like it was playing it safe with character types, or that the characters will be defined as it progresses. If you like RPG-style battles and a show which reminds you of different anime and/or games, I'd say God Eater is the one for you.